While boat anglers may have access to a slightly larger variety of fish species, shore anglers can still find plenty to feast upon along the banks of the area’s lakes. Fishing guides Rodney Hairgrove and Doug Wynn have been casting their lines in the waters of Kentucky Lake and Lake Barkley for a number of years. So, they know a thing or two about where to find the best catches. Here are a few bits of advice we gathered from these experienced, licensed fishing guides that will make bank fishing more productive for you and your friends. While there are a lot of convenient spots located along the banks where anglers can fish, not all of these spots are going to produce a lot of fresh catches. For instance, it’s important to consider the time of year in which you are fishing and to note a few other features of the area. “A topographical map is a must for this type of fishing,” Rodney says. One common mistake that shore anglers make is to assume that all banks are the same. Rodney suggests finding spots that offer deep water access, as well as banks that feature submerged brush, and rocks, gravel, or manmade structures. Whether fishing from a boat or from the banks, investing in the tools of the trade is always a good first step. First, purchase good equipment. “Good equipment will mean more success,” Doug says. He recommends a reel that will hold at least 100 yards of quality line that has been tested against the type of fish you’re seeking to catch. The type of rod you select should also be appropriate for the type of fish you want to hook. Second, buy a topographical map of the area. ‘’A topographical map will tell (the angler) what the water depth is right up to the bank. Most anglers will have better catch rates if their chosen fishing spot has medium to deep water close by,” Doug says. “Bluegill spawn on Kentucky Lake around the first of May and banks are ideal spots for this type of species in big schools,” Rodney says. While shallow waters may be productive for fishing in the early spring, as fish begin to spawn, they won’t be as plentiful for bank fishermen at other times of the year. A great location can be found in the deep waters located near the dam areas. These fishing spots are usually easy to walk to, but a topographical and structural map will help you locate the best access points. The completion of the Eggner’s Ferry Bridge has also created new fishing access trails that have been built on the southwest and northeast banks of the bridge. Tail water bank areas of the dams along Kentucky Lake and Lake Barkley also offer productive fishing spots along the lakes. Anglers will have to watch for signage to find the best way to reach these destinations. Another common mistake that anglers often make is assuming that worms make good bait for all species of fish. This is simply not the case, Doug says. 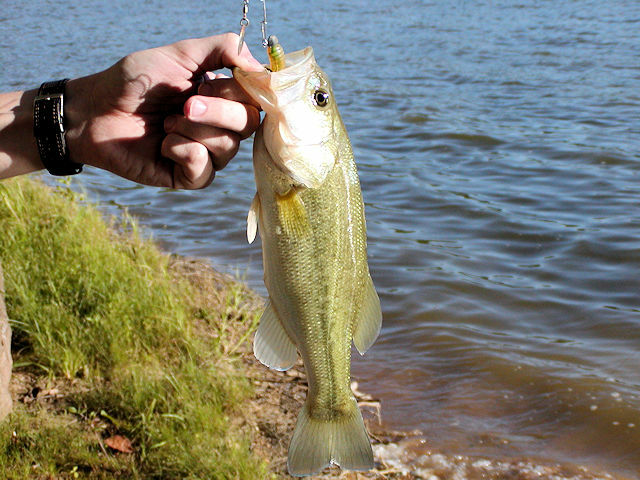 He recommends anglers choose bait that is well-suited for the type of fish they wish to catch. “For instance, worms are good choices for most fish species, however, they aren’t likely to work as well with crappie,” he says. “Good equipment for the bank angler doesn’t have to break one’s budget. Most sporting and big-box stores have rods and reels that are matched as a package and most will already be spooled with line to match,” Doug says. Types of species you’ll find along the banks will depend on the time of year. There are enough species swimming in these waters to fill a string or basket without any trouble. Catfish, crappie, white bass, stripers (rockfish), hybrids, bass and bluegill are plentiful along the banks throughout most of the year. “I caught my largest bluegill ever, a 10.5-inch monster, below Barkley Dam several years ago, while fishing from the banks,” Doug says. Before heading to the lakes, be sure to book a comfy cabin, motel room, rental or campsite. Then prepare to enjoy the picturesque scenery as you relax along the banks of the region’s most beautiful lakes and reel in the big one! With all of this great advice, you and your friends are sure to have a great time fishing the waters along the banks of the region’s lakes.